Hawthorn members support trade mission travel, and diplomatic expenses. Hawthorn also provides administrative support for the work of the Trade Office in the Department of Economic Development, including recruitment of businesses into the trade mission program and oversight of international conferences on behalf of Missouri. 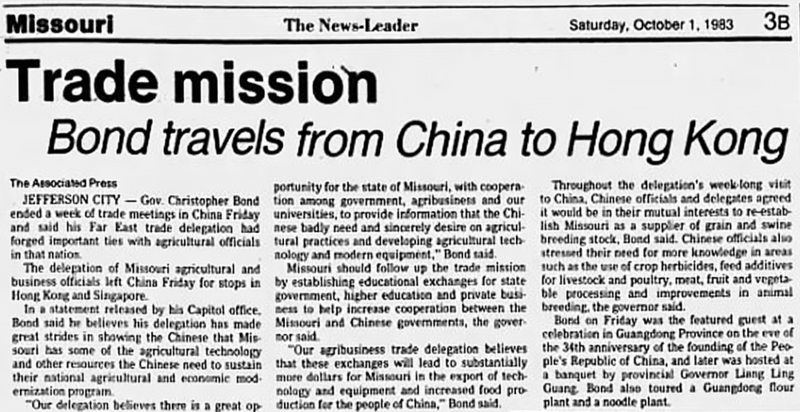 Hawthorn has a long history of support trade missions - above is an article from Governor Bond's trip to China in 1983. A manufacturer of gaseous nitrogen generators met with 11 companies, signed agreements with 4 buyers and realized an increase in export sales of $1.5 million in the following 12-month period. A manufacturer of processed foods met with 22 companies, signed with 1 distributor and realized an increase in export sales of $400,000 in the following 12-month period. A lumber producer met with 14 prospective partners, signed 3 distributor contracts and realized an increase in export sales of $120,000 in the following 12-month period. The Missouri Partnership and the Missouri Department of Economic Development work together to represent the state and our businesses with International Trade & Investment Offices around the world--find a complete location list here. Contact Hawthorn Foundation for more information on participating in an upcoming trade mission.